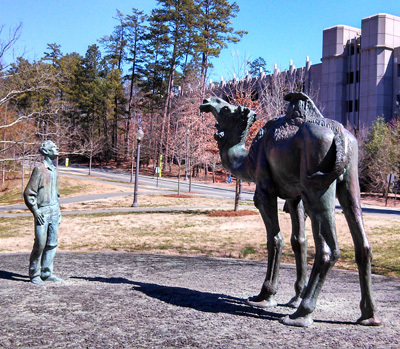 The camel sculpture, eight feet tall and weighing four thousand pounds, stands across from a life-size representation of Knut Schmidt-Nielsen, a noted Duke zoology professor. Standing facing each other, they appear to be in some form of communication, with their looks conveying the complexity of mutual understanding and curiosity. The camel has one hump, stands on legs that are four and a half feet tall, and has a tail that seems to be in mid-wag. Schmidt-Nielsen is dressed in casual clothes, conveying a scientist ready for field work. His pose and gaze represent the curiosity of the professor and of the scientific community as a whole. Schmidt-Nielsen began teaching at Duke University in 1952, where he studied how camels conserve water. His studies included a year-long trip to the Sahara Desert where he discovered the actual water conservation physiology of the camel and disproved the common belief that it holds water in its humps. He made numerous contributions to the field, particularly regarding how animals adapt to their surroundings and especially in extreme climates. Schmidt-Nielsen, a James B. Duke Professor Emeritus, was inducted into the Royal Society of London in 1985 and received the International Prize for Biology from the Emperor of Japan in 1992. He passed away at the age of 91 in 1997. The sculpture sits on Science Drive near the entrance to the Duke University Biological Sciences Building. The sculpture is situated near the sidewalk, surrounded by grass and next to a wooded area.